Discount is based on the published room rate. Promotion valid from 1 September 2018 until 22 November 2018. Present UOB debit or credit card at the Lost World Hotel reception counter in order to enjoy the promotion. Max of six (6) room can be purchased per card per day. Phone (05-540 8888) or email ([email protected]) reservation is required before proceeding to Lost World Hotel. Surcharge of RM130.00 is applicable during Eve of Public Holiday, Public Holiday, Malaysian School Holiday and Super Peak Season. Surcharge of RM40.00 is applicable for check-in during weekends (Friday & Saturday). The room rate is inclusive of 2 Breakfasts and 2 Lost World Hot Springs & Spa by Night admission tickets. Non-refundable, not exchangeable for cash & not applicable with other ongoing offers, events and/or promotions. All transactions made are strictly on cash or credit card basis upon purchase. 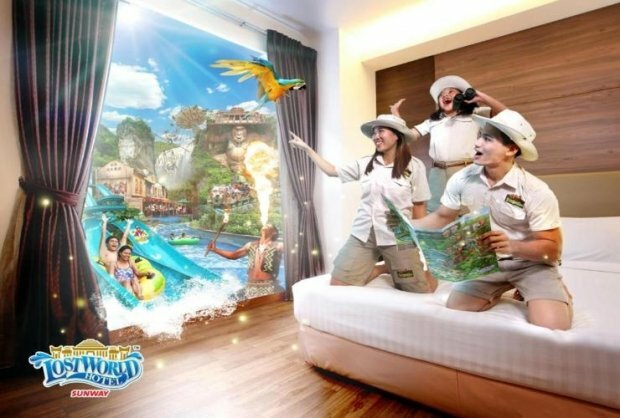 Sunway Lost World Hotel Management reserves the right to refuse, alter, amend, delete or add to the stated terms and conditions or withdraw this promotion at any time without prior notice. Check out Lost World of Tambun Promotion for more details about this offer and to book your accommodation now!